We are based in the very heart of Cornwall in the port of Falmouth within easy reach of a variety of beaches and places of interest. There are many excellent transport links to Falmouth. We are open all year round for short or long stays. We accept mid week bookings, and our kitchen can cater for both Vegetarians and Vegans. All rooms have digital freeview colour television and coffee/ tea making facilities. We have en-suite rooms, and a free Wi-Fi connection to the internet is available in every room. Complimentary memebership for all guests at Falmouth Sports Centre directly opposite. Our flexible approach means that the Lyonesse is ideal not only for holiday makers and tourists but also for business people working in the area or prospective students and their families. 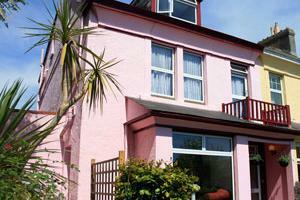 The Lyonesse Guest House has been established for over thirty years. It comprises six guest bedrooms, with a choice of single, double and family rooms, and has an esteemed reputation in the local area. We aim to make the Lyonesse Guest House as environmentally friendly as possible. For example, we are committed to the use of green cleaning products and reduced energy light bulbs. We endeavour to use recycled materials and recycle our rubbish, and we encourage our guests to do the same while they are staying with us. We strongly believe in sourcing local and organic food products whenever possible, and use Fair Trade tea and coffee. Reductions for bookings for more than one night – single occupancy supplements. For further information on all the facilities on offer please visit the website. Note: tariffs are a guide and are subject to change by the proprietors.